1. The Eagles have work to do, and they didn't come out healthy. It's just the preseason. It's just the preseason. It's just the preseason. Say it over and over again. For the second straight week, Doug Pederson's troops played sloppy football on both sides of the ball and throughout the lineup. The Eagles turned the ball over twice, committed nine penalties, and had various missed blocks and tackles. The preseason is for working out kinks, but they're running out of time and now suddenly players. A passing grade for Eagles offense? Not until key wide receivers return. As poorly as the Eagles looked a week ago against the Steelers, they came out relatively healthy. But Thursday night's list was long when the final number of injured was tallied. Most of the names won't cause mass panic across Philadelphia, but Nick Foles left with a shoulder strain, further clouding the quarterback situation. Receiver Bryce Treggs (hamstring), tight end Richard Rodgers (knee), cornerback Stephen Roberts (ankle), tight end Joshua Perkins (concussion), receiver Kamar Aiken (hamstring), and tackle Taylor Hart (cramps) all left and didn't return. The Eagles were already without 15 players – 10 of them projected regulars – so depth will be an issue over the next few weeks. The good news: None of the injuries was initially deemed serious. But with the effort on the field inconsistent, Pederson would prefer a fuller deck from which to choose. 2. Nick Foles is rusty, and now he's hurt. The Eagles' backup quarterback played his first live football since the Super Bowl, and let's just say it wasn't quite on par with his MVP performance. He overthrew several passes, even on short dumps. He held the ball too long and was sacked twice on the Eagles' first three drives. And he wasn't in rhythm with his receivers. Some of his rustiness was to be expected. He was without three of his top four wideouts. Aiken had a drop. Foles is a streaky quarterback. His highs are high, but his lows can get ugly. It shouldn't take much to turn him around, but now he must deal with the shoulder. Foles said after the game that he was optimistic about his recovery, but he had yet to undergo any tests. I can't imagine he'll be able to play in the final two preseason games, which would put him up against — best-case scenario — the season opener. Carson Wentz has yet to be cleared for contact, and he remains a long shot to play in the preseason. His readiness for the Falcons on Sept. 6 is also still in question. He has said it will likely come down to the wire. If Wentz is ready, Foles' injury doesn't have much relevance. But if he isn't, the Eagles will need to start preparing third-stringer Nate Sudfeld for the possibility of being the Week 1 starter. 3. Halapoulivaati Vaitai is still a work in progress. The Eagles don't win Super Bowl LII without Vaitai's holding down the left-tackle spot after Jason Peters' injury. Was he perfect? Not by any means. Did Pederson have to scheme help? Yes. But Vaitai solidified himself as the Eagles' swing tackle for 2018. Peters is fully recovered from ACL surgery and is on target to start the season, but the Eagles have opted to hold the 36-year-old Pro Bowler out of the preseason. Understandable. Vaitai did fine in the preseason opener. But he had several technical issues against the Patriots. He either overset vertically or was late to the edge. Adrian Clayborn ate his lunch on the outside rush that knocked Foles from the game. It was just one game. Vaitai played the most snaps of any Eagle and settled down some. He has looked sharp in training camp. But the odds are the Eagles will need him at some point this season and they can't afford for him to regress. Tom Brady throws a first-quarter pass. 4. The Eagles' defense still hasn't figured out Tom Brady. Join the club. Brady led the Patriots to 20 points in less than a half of football. He completed 19 of 26 passes for 172 yards and two touchdowns. He didn't turn the ball over, and he was not sacked. Jim Schwartz didn't spend practice time preparing for New England, and it showed. Brady's performance felt like a carbon copy of his play in the Super Bowl. The Patriots would motion a receiver, the Eagles did little to disguise whether they were in man or zone, and Brady would find the weak spot. Penalties didn't help the Eagles' cause. I'll get to the tackling fouls, but there were other errors. I think the biggest problem was the lack of pressure. Brady had a lot of time, and when he was moved off his mark, he navigated the pocket. I thought Ronald Darby was the lone bright spot. He blanketed his opposition in man coverage and nearly had two interceptions. He probably should have caught one, but if he could catch, he'd be on offense. Darby is primed to have a strong season – his last on his rookie deal. 5. The Eagles need to work on their tackling regarding the new rule. The Eagles were flagged three times for "lowering the head to initiate contact." Safety Rodney McLeod came over from the post to tackle running back James White on a long rush and clearly, in my view, lowered his head. You may not agree with the new rule, but his attempt was in violation. Linebacker Nigel Bradham's hit was a little more in that gray area. He led with his shoulder, but made contact with the crown of his helmet. Safety Jeremy Reaves was also penalized. Reaves is unlikely to make the Eagles roster, but McLeod and Bradham are starters and will need to re-evaluate their methods. Have the calls been excessive? Maybe. The NFL might be enforcing the rule to its extent only to ease back when the season starts. Officials did the same a few years back with illegal contact. But the Eagles can't go into the season thinking that the officiating will be as it was last year. The game is changing, and they need to adapt. 6. The Eagles' young cornerbacks were inconsistent. Sidney Jones started in the slot, but he was soon replaced by rookie Avonte Maddox. Schwartz appeared to be using multiple personnel groupings in the nickel based upon matchups. Maddox did fine. He had a tough assignment in Julian Edelman and allowed a touchdown when Brady found receiver Chris Hogan. Rasul Douglas started in place of injured Jalen Mills. He had a nice early stretch, reading a screen and making a run stop near the line. Jones showed some positive signs. He finished with four tackles – one for a loss – and two pass breakups. But he looked bad when he bit on a Cordarrelle Patterson juke in the open field. Eagles running back Wendell Smallwood receives a handoff from quarterback Nate Sudfeld on Thursday night. 7. Nate Sudfeld is growing before our eyes. 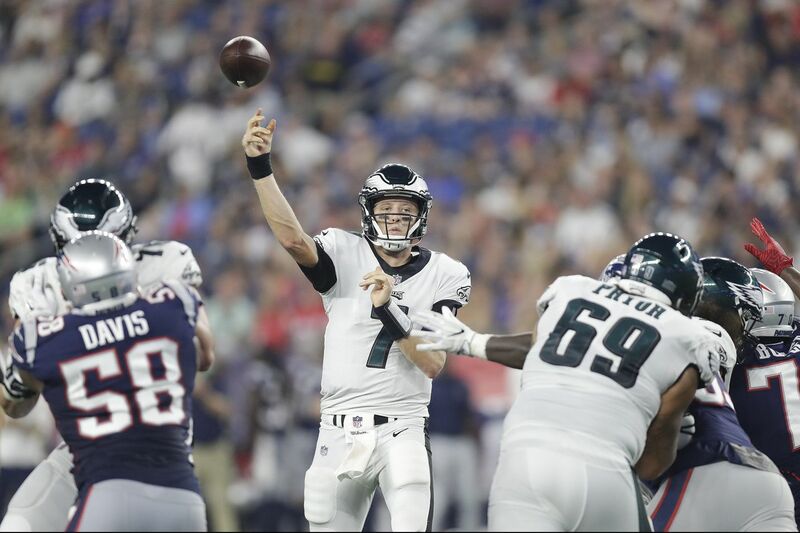 The Eagles' third-string quarterback put up some strong numbers, completing 22 of 39 passes for 312 yards and three touchdowns. His lone interception came when running back Matt Jones allowed a short pass to slide through his hands. Sudfeld had several impressive throws. The best was a 57-yard strike to receiver Shelton Gibson from his own end zone. The ball was perfectly placed. Sudfeld was sacked four times, a few because he held the ball too long, but he also showed a knack for knowing when to throw the ball away and live for another down. Sudfeld is far from a finished product. He doesn't have Wentz's skill set or Foles' experience and knowledge of reading defenses. But he has obvious talent, and one thing Pederson and his staff have shown is an ability to develop quarterbacks. 8. Shelton Gibson is on the roster and could have an increased role on offense. Gibson caught five passes for 90 yards. He scored his second touchdown of the preseason. He once again displayed his improvement over his rookie season. He also averaged 30.3 yards on four kick returns. He might have sealed that job. But on offense, he's made the best of his opportunities, and with the Eagles light at receiver – now and possibly into the season – he could factor into game plans. He hasn't had as many repetitions against the Eagles' first-team defense, but he has made more plays than Mack Hollins in camp. Hollins didn't play against the Patriots. Bryce Treggs had a few moments, but he reinjured his hamstring. He had a chance to win the sixth-receiver spot ahead of Markus Wheaton, who has also been sidelined. Aiken didn't impress. De'Andre Carter can play, but his height (5-foot-8) is hard to overcome. Rashard Davis pulled in a 31-yard grab, but his punt returning was nauseating. 9. The fourth running-back spot is still up for grabs. You know you have a deep roster when the fourth tailback spot is one of the more intriguing positional battles. Undrafted rookie Josh Adams seemingly had the job in hand, but he missed the Patriots game with an unspecified lower-body injury. Has he done enough to secure a spot without playing in the rest of the preseason? Maybe. But his absence gave his competitors extra snaps. Donnel Pumphrey hasn't been able to take advantage. He's yet to play and is running out of time. Wendell Smallwood could win the job by default. He runs hard and has managed to stay healthy this summer. But the production hasn't been there. He gained just 1 yard on four carries. Jones hurt his cause. He caught six passes for 32 yards and rushed six times for 23 yards, but he also dropped three passes and just didn't look explosive. 10 And some leftovers: Cameron Johnston punted well. He averaged a 46.6-yard net and dropped two punts inside the 20. He's one step closer to securing the punter spot. … Zach Ertz and Dallas Goedert were on the field together at various times. While Foles threw to Ertz only once, for 20 yards, the Eagles' two-tight-end set should be a vital part of the offense. I don't see why Pederson would unveil anything new there. Goedert had another nice game receiving, although his blocking was suspect. He was late on a goal-line block. … Jake Elliott missed an extra point as 30-something-yard kicks continue to bedevil the kicker.